Friday night in Barbados is legendary for the Oistins Fish Fry and so we made the journey on day two of our holiday. The journey from the Gap was fun in itself. 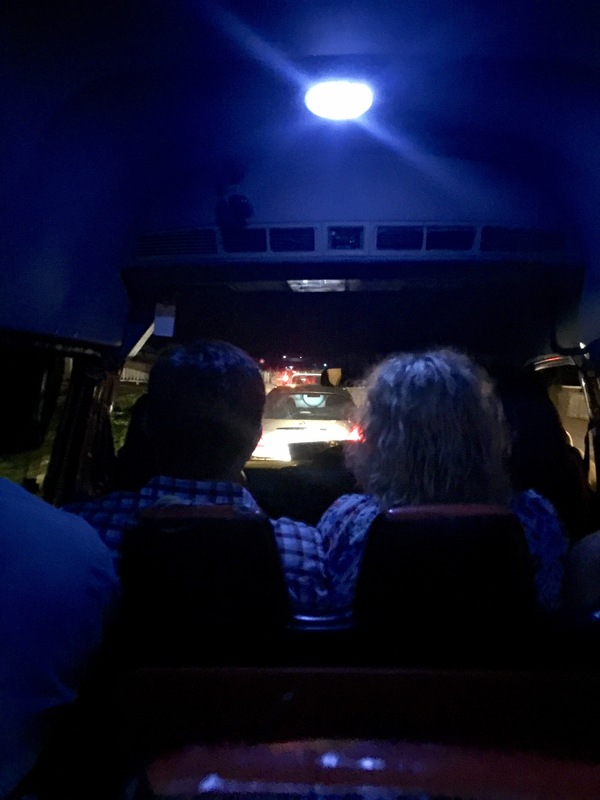 We caught a Reggae van – a taxi shared with anyone else going in the same direction. It’s typically manned by a driver and a wingman. The wingman looks out for anyone remotely looking like they are going in the same direction and gets them aboard, the fee is a flat 2 Barbadian dollars and in return you get a cosey, combative and rapid drive with a soundtrack of reggae at varying volumes. We went early to Oistins because we wanted to avoid the worst queues and enjoy the sunset. We had time to see the last fishing boats unloading and walk out on the pier and we were so glad we had. Someone was feeding a family of turtles with the scraps of fish. Swimming with turtles is one of the must-do things on the island. The turtles are huge and green. The evening light was a lovely peachy colour and the air was soft. At the end of the pier was the fish market which was busy processing the fish which would end up in the fish fry. Around the sheds were loads of egrets and cats looking for scraps. It’s a fabulously direct food chain. Next door are rows of sheds selling craft items or fish dinners. We tried Uncle George’s. The menu is simple – barbecued fish with side orders. I had dolphin or mahi-mahi with rice and peas. (Lots of people getting confused that this was beloved Flipper on the grill). Mrs Miller had lobster. The dolphin came in a large steak with barbecue stripes across it – all sitting on a bed of rice and peas. There was a garnish of salad and some tartar sauce. It came in an unpreposessing styrofoam tray. Presentation with street food is nothing compared to the flavour. The fresh fish was sensational I am pleased to say. Cooked perfectly with good seasoning it was a healthy, tasty dinner accompanied by a couple of bottles of ice cold Banks’s beer. My wife had the lobster cooked with garlic butter and pronounced it the best lobster she had ever had. She had it with garlic baked potatoes. Sandy Lane Gold Cup at Garrison Savannah. Communal eating is a favourite thing of mine. On balmy Caribbean evenings Oistins Fish Fry is a great fun experience. Our meal cost 90 US dollars plus 2 dollars each way on the fabulous Reggae Van. This entry was posted in Review and tagged Barbados, dolphin, egret, Fish Fry, fish market, garlic, lobster, mahi mahi, Oistins, Reggae Van, Sunset, turtle. Bookmark the permalink.